New digital billboards that have popped up at light-rail platforms over the past month are bringing advertising messages to riders and a nice chuck of change to Metro Transit. The transit agency will be paid $23,450,000 spread out over five years as part of a deal with Intersection, the company formerly known as Titan. In return, the advertising giant will show messages that will range from everything from lottery numbers to special events to messages from nonprofits and local retailers. 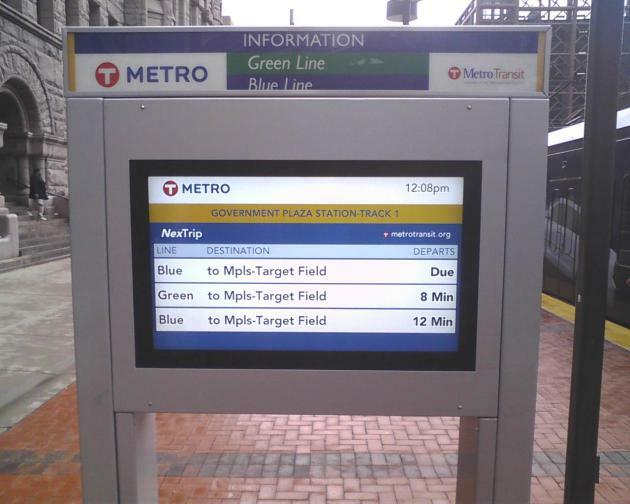 The 55-inch high-definition screens along the Blue and Green lines also show arrival and departure information. With Metro Transit ridership at all-time highs, several local advertisers are already taking advantage to reach new audiences. “The digital screens have been instrumental in enhancing our brand awareness across the Twin Cities area," said Jenifer Skjerven, Membership Marketing Director, YMCA Twin Cities. Another early advertiser, Metro PCS, said it has received positive response from commuters who have become aware of its products. So far 38 of the signs have been put up in the Twin Cities, including at the Mall of America, Bloomington Central, Lake Street/Midtown Downtown East, Nicollet Mall, Hennepin Government Center, Hennepin Avenue/Warehouse District and Target Field stations.